Due to the snow before Christmas, we missed out on a delivery of the rest of the lace bow ties and it was a nice package to pick up in the new year. These remaining samples are made out of various lace textures in white and alabaster and some have signature contrast black collars. 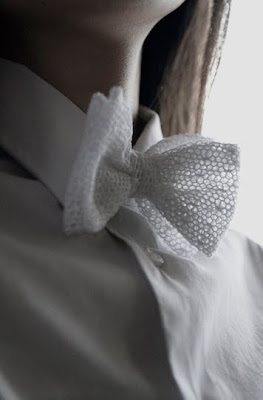 Our lace bow ties have been created out of traditional English spun lace and then hand crafted in outer London. Next week we will visit these bow tie makers to take a peak behind the scenes and Callum Toy will take some photos of the process. In the meantime, the lace bow ties are being hand carried around London in a vintage leather suitcase to Marwood sales appointments. So far, so good.